Let your second graders' morning work actually work for them to master essential Common Core English Language Arts and Math skills by the end of the year through continual daily review. This strategy always produced amazing results with my second graders, because they didn't forget what they had learned. second-nature over time, which helps to strengthen writing abilities in all areas. The sentences are aligned with the READING STREET reading series units, but can be used effectively with any second grade language arts program. 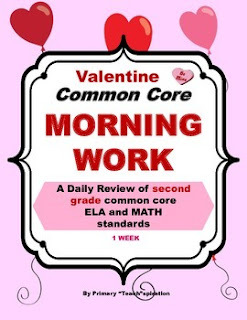 The Math Review portion is designed to practice and spiral review ALL Second Grade Common Core Standards in a repetitive format that increases in difficulty over time, including 5 addition and/or subtraction facts on every page. This Freebie is a one week sample of my yearlong units. room or center, or projected as a transparency. These posters are very helpful for solving Common Core story problems. * Look for the STAR next to my logo on any page within my store and click it to become a follower. Voila! You will now receive customized email updates about this store. ~ Thank you for ALL you do for your students! Happy Valentine's Day!